On August 15, 1944, the 180th Infantry Regiment landed near St. Maxime, France, and launched its attack on "Fortress Europa". While one battalion cleared the coastal road and beaches of enemy, two battalions raced inland to tie up with the paratroops who had been dropped in the vicinity of Vidauban. From then until the close of the period of Battle Star Four, the action was mostly of a Task Force nature. On August 20th, the battle of Peyrolles was fought, and the race to the north was begun. 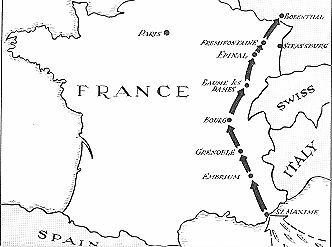 Mounted on trucks, the regiment raced through Gap and Grenoble and struck toward its first large city, Bourg. It was at the approaches to this city that the enemy was routed, after a fierce fight at the town of Ceyzeriat. Once this resistance was overcome, the regiment advanced into Bourg, then quickly pushed ahead and crossed the Durance River. On September 7th, the regiment forced a crossing of the Doubs River and by the end of the next day, had liberated the town of Baume les Dames. Continuing its rapid advance, the regiment seized Rougemont on September 12th, and Villersexel on September 15th. Upon being relieved by units of the 1st French Army on September 19th, the regiment made preparations to assemble in an area southwest of the fortress city of Epinal. Battle Star Four had been added to the regiment's theater ribbon.